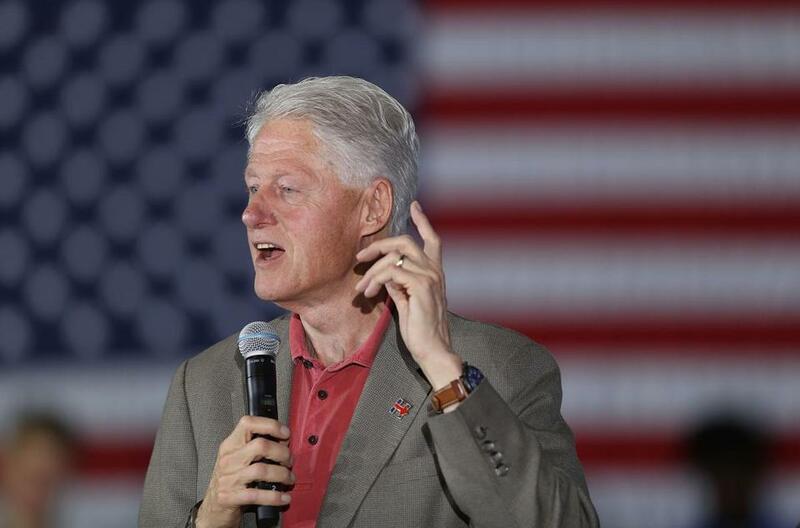 Former president Bill Clinton spoke in Florida on Tuesday. WASHINGTON — Only days before the presidential election, the FBI released an archive of documents from a long-closed investigation into Bill Clinton’s 2001 presidential pardon of a fugitive financier, prompting questions from Hillary Clinton’s presidential campaign about its timing. The release comes amid the bureau’s controversially timed review of emails from a Hillary Clinton aide. The 129 pages of heavily censored material about Bill Clinton’s presidential pardon of Marc Rich were published Monday on the FBI’s Freedom of Information Act webpage and noted by one of the bureau’s Twitter accounts Tuesday. Earlier in October, the FBI unit published historical files as far back as 1966 about Donald Trump’s father, Fred Trump. The Clinton campaign questioned the bureau’s decision to make the file public so close to Tuesday’s election. ‘‘Absent a (Freedom of Information Act) deadline, this is odd,’’ Clinton campaign spokesman Brian Fallon tweeted. ‘‘Will FBI be posting docs on Trumps’ housing discrimination in ‘70s?’’ Fallon’s reference was to news accounts of a 1973 federal housing discrimination lawsuit, later settled, against Republican presidential candidate Donald Trump. White House spokesman Josh Earnest said he saw the FBI tweet shortly before he boarded Air Force One with President Barack Obama for a trip to Columbus, Ohio, to campaign for Hillary Clinton, but was unaware that anyone at the White House was consulted about the material before it was released. ‘‘I’ve not spoke to anybody who has any awareness of being consulted about that material before it was released,’’ Earnest told reporters traveling with the president. The newly released FBI documents are from a 2001 federal investigation into Bill Clinton’s pardon at the end of his administration of Marc Rich, who was indicted in 1983 and evaded prosecution in Switzerland. Rich died in 2013. Rich’s ex-wife, Denise Rich, pledged a $450,000 donation to the Clinton Foundation’s project to develop and build the presidential facility. The new FBI archive does not name Denise Rich, but FBI agents sought to talk to her as part of the probe into her former husband’s pardon. Despite the extensive redactions, the FBI archive cites evidence being prepared for a federal grand jury, agents’ reports and internal memos. Agents appeared to be interested in a New York dinner in which the Rich pardon may have been discussed. The federal probe started under then-U.S. Attorney Mary Jo White, who now heads the Securities and Exchange Commission for the Obama administration. When White left office in 2003, she was replaced by James Comey, the FBI director now under fire for notifying Congress last week about his agency’s decision to review emails to and from Clinton aide Huma Abedin. The Rich investigation did not lead to federal charges under Comey and the case was closed in 2005.